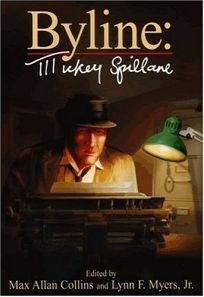 Byline: Mickey Spillane, edited by Max Allan Collins and Lynn F. Myers Jr., offers a wealth of rare Spillane material: two Mike Hammer cases in short story form that later appeared as novels, the transcript of a Mike Hammer playlet, 14 articles by Spillane and more. The cloth collector's edition includes an audio CD with three Mike Hammer adventures, one of which features Spillane himself in the role of Hammer. .